From birth our first task is to learn to be independent within the boundaries of our physical limitations. If able, we learn to walk, use objects and communicate, first with help and later without the help the help of our carers or parents. Some of us need to rely upon physical aids or medicines in order to maintain or extend our capabilities. As we grow physically and emotionally we learn to look after our selves and others. However, our belief is that total independence, in the sense of not needing anyone or anything, is unhealthy for most of us and may lead to isolation and loneliness. A healthier choice is to seek what we need from others when that need arises, and so achieve a healthy balance between independence and dependence, the changing state of inter-dependence. This is the reason we offer self help resources as aids to the growth or change you may choose. You may wish to begin with the motivational assessment. This is written to allow a kind of stock take of your life and to plan what you need to do to make the changes you decide you need it is called "motivational" because motivation comes from how we feel, and the goal planning takes out feelings very much into account. The cycle of health looks at how we may block our feelings or actions with the strong possibility of stress overload, anxiety or depression. Self assertion includes some techniques for being able to tell others what we want or need in a way that is clear and opens the way for dialogue and negotiation. This is a healthier option than being passive or aggressive and follows the process suggested in the healthy cycle. Stress management has some good suggestions for expressing our feelings in ways that are good for us and not harmful to others. Finally the change curve describes the process of grief, change or loss. When we lose someone or something that we love in our own way and time it is healthy for us to allow this process. We need to recognise that it is not a step by step or linear process, but that any stage is likely to be triggered by a reminder of who or what we have lost, A key choice is to allow the feelings when it is safe for us to do so in order that we can begin to let go and make room for whatever is new in our life. We hope that these resources will be helpful for you to use alone or with a friend. We look forward to receiving your feedback through our contact page and perhaps working with you should you wish. If we take stock of our lives it is rather like looking at an almost complete jigsaw in its box, although there maybe a few pieces here and there that need to be put in place we can see the overall picture. However, when things go wrong- illness, death, job loss, problems in close relationships or with kids etc., etc, it is as if there has been a blow to our jigsaw box, the picture is no longer clear and it feels like our life is falling apart. The examples given of things going wrong and many others are stressors -they cause stress, a hormone-mix is released in our body in preparation for fight or flight. Stress -Strategy suggests how we can healthily help our bodies normal stress response to the things that threaten our well being. However, first Motivational Self Assessment may well be helpful. It is a tool to work out what is ok and what is not ok when our lives seem to be falling apart so that we regain perspective and control and reframe our problems in terms of solutions. How ? The assessment focuses on our Physical Health, Psychological Health, Social Support, Actions in the area of eating , drinking, smoking, drug taking, spending, and finally Work Issues. Once complete, we can see those parts of jigsaw life-picture that are in place and ok and a source of strength and power available to us. We are also able to see which source of stress is most fundamental so that we can choose to work on this. Our next choice involves a SMART solution, one that is Sustainable, Manageable, Achievable, Realistic and Time specific. Unfortunately, this excludes winning the lottery and means that we need to choose a goal that is in our power. 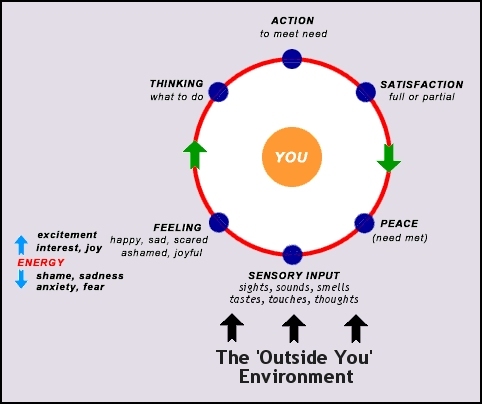 If we accept the view that our energy or motivation changes according to how we feel, then in order to find the energy-feeling you need you can try the following strategies. Think back to a time of triumph of success unrelated to your present difficulty. This maybe for example, passing an exam or driving test getting married, scoring a goal, saving a goal, receiving or winning a prize etc. Next remember how you felt. For most people, this will be something like "I felt really happy, confident and full of life and energy". Next, if you felt like that now, what would you do to achieve your SMART goal. Hopefully, by remembering your moment of triumph you feel it all again and now have your action plan. Or Imagine that when you go to bed tonight a miracle happens and when you wake your self esteem is sky high, you feel confident, powerful and able to tackle anything. What difference would It make and what would you do? Hopefully your plan of action would come from this. Download the motivational Asssessment Form in Microsoft Word format. Download the motivational Asssessment Form in PDF format. As an example of how the healthy cycle works, if we hear something good or our stomach rumbles, we are likely to feel happy or hungry. After thinking briefly, we may thank the person who has said something good, or we may eat something. We may be then satisfied or perhaps spend more time with our friend or eat something more. When our need is met we have a sense of peace or rest and are open to whatever next comes into our sensory awareness. So far, so good. However, if something unpleasant happens we may "block" the feelings through alcohol/drugs or over activity so that our feelings are "bottled up". Otherwise, our actions to meet our need may be frustrated, or with death or relationship break up there may be nothing we can do. Please see the "change curve" under self help resources which describes the necessary process. Then we are likely to feel drained or tired, have stress overload symptoms (see "stress strategies"), or with a lot of "unfinished business" may not know where to start (motivational assessment maybe a good place). Feelings are what motivate or fail to motivate us and this is shown by the "energy" arrows underneath "feelings" on the cycle "blocking" "discounting" our feelings are likely to have unhealthy consequences for ourselves and others e.g. anger may be expressed unwisely in our relationships, our driving or perhaps at football matches, for instance. In these circumstances, seeing your doctor for a check-up (to exclude physical causes), using the self help resources here, talking to a good friend or seeking professional help through our contact pages are all healthy options should you wish to change. 1. Ask for what I want, though I realise that the other person has the right to say "No". 2. Have opinions, thoughts, feelings and emotions and use them appropriately. 3. Make statements which have no logical basis, and which I do not have to justify (e.g. intuitive feelings and ideas). 4. Make my own decisions and cope with the consequences. 5. Choose whether or not to get involved in the problems of someone else. 6. Not know about something and not understand. 11. Be alone and independent. 12. Change myself and become assertive and the person I want to be. Decide if it is fair. Are not be afraid to take risks. Give and take compliments easily. Give and take fair and honest criticism. If we want to be assertive we do not:- Beat about the bush. Often people want to be more assertive because they think they will get what they want more often. This is not necessarily so. Someone who aggressively demands money waving a gun is more likely to get what they want than a beggar who assertively says "I am hungry, please give me £1 so that I can eat. However, often apparently successful people, who have used underhand methods and aggressive behaviour are lonely and unhappy with few real friends and poor self-esteem. In contrast, assertive people are generally confident, relaxed and happy to be themselves. Let us look at why. Assertive people tend to be aware of their strengths and weaknesses. They are not afraid of taking risks, failing or making mistakes, and will learn from what went right and what went wrong. Since they know their capabilities they are able to set realistic and achievable goals. Assertive people are able to cope with unfair criticism, and deal with it appropriately. There may be times when it is wise not to use assertive behaviour because it may place you or others in danger as in the case of our aggressive thief with the gun. Over-reliance on these two basic animal responses leads to mental health and relationship problems. Thankfully man has developed a third response to problems which uses his ability to discuss, argue and negotiate. Assertiveness training is designed to develop this response and practice the appropriate behaviours. Consultations with professionals-solicitors, doctors/nurses, counselors/psychotherapists! The easiest problem person or situations should be placed at the top of your list, to be tackled first. If you want to play football for England, practice first in the local park. If you want to sing like Pavarotti start by singing in the bath. In risking a new assertive approach build your confidence by taking a small step first. Ask paperboy to stop whistling at 7am. Confront shop about lifting of new carpet. Stop patronising and criticising my children. Say "no" to helping at jumble sales. Ask my boss to treat me with respect. Ask my wife/husband to change their attitude to me. Most unassertive people take 'No' for an answer far to easily. The main technique to practice the art of persistence is broken record. When a record is scratched we hear the same track over and over again and move quickly to stop the repetition. Broken record is the skill of being able to repeat over and over again in an assertive and relaxed manner, what it is you want or need, until the other person provides it or agrees to negotiate with you. The main benefit is that once you have prepared your 'lines', you can relax. You merely repeat your script, no matter how abusive or manipulative the other person tries to be. It is mainly a self-protective skill and not designed to produce interesting conversations with people! Techniques include the ability to try to understand how the other person feels, to try and stand in his shoes and see how it feels. It is important to listen carefully and give your understanding of what is being said in order to gain clarification. Keep calm it can be useful to write down beforehand what you wish to say and to achieve, this is known as script-preparation. Keep to the point, using broken record can help to do this. Do not be stubborn and be prepared to offer a compromise. In a very difficult situation it is often a great help to role play beforehand with a trusted friend playing the part of the 'opposition'. Acknowledge how the other person thinks/feels(see their point of view) "I know you are tired when you get home from work, however....". Say how you feel/think - "when you grunt at me and then concentrate on 'Eastenders' I begin feeling quite annoyed!". Say what you want - "I would like a proper 'Hello, how are you?' and a hug". The negotiation should be based on opinion supported by facts not on opinion alone e.g. 'You seem not to care about me, because you sometimes appear more interested in Eastenders than in what sort of day I've had.' v. 'You do not care about me!'. Stress is the body's normal response to challenge, threat of harm or loss or the need to perform. Before an important race, the runners can be seen walking around, moving their arms, shaking their hands and at times staring into space as they imagine being first away from the blocks and first to cross the finishing line. They are fine tuning their physique through movement and creative visualisation techniques to ensure that they are ready for the starting gun. When we experience the changes that are part of being alive there may well be a physical stress-response. The changes and challenges include losing a loved one through death or separation, job worries-loss of job or work overload, moving house, struggling with relationships, getting married, having a baby, suffering illness or traffic jams, irritating kids, moody colleagues etc. Our physical stress response involves the release of a cocktail of hormones to prepare us for fight or flight or running that race. Blood supply is concentrated on the vital organs, heart, lungs and muscles so our hands and feet may feel cold, and we are very alert, ready for action. The key point is that we are highly unlikely to respond to everyday stressors (an event causing stress) by running away or fighting. He consequently we remain ready for action and stressed and may feel tension in our shoulders and neck, headache, upset stomach, backache and be forgetful, short-tempered, snappy and have difficulty concentrating. These symptoms are very different to those of the athlete who has now run her/his race. S/he is likely to be out of breath, drinking water and, after warming down, 'chilling out' and feeling really good. This is due to the release of the happiness hormone, endorphin, after her vigorous exercise. Endorphin serves also as a painkiller so that we can complete our fight, flights or sports and afterwards feel the pain and tend to our cuts and bruises when we can rest. Some thrive on the adrenalin-endorphin buzz from working under pressure, and it is worth bearing in mind that, perhaps both with people and musical instruments, without tension there is no music. However, with too much tension or stress we get 'screechy' and may 'snap'. The strategy with stress-overload is to remove or reduce the stressors which are harmful and manage those that remain. Completing the Motivational Assessment and practicing Self-Assertion are useful tools in this process. Please also look at the Change-Curve in order to gain an overview of what feelings are normally around when experiencing loss, bereavement or change. You may also wish to try brief or longer term psychotherapy or e-therapy to support you within the process of change or grief. Try getting rid of anger in socially acceptable ways such as punching a pillow, punch-bag or the bed, playing competitive sport (check with G.P. if doubtful about fitness). Write your feelings down - in a letter to the person you believe is responsible - be explicit in what you say. Once your letter is complete, screw it up, then burn it. Angry feelings dealt with in this way lose their power and harm no-one. You can do this as often as you like or need. Walk, jog or swim to mimic fight and flight. Exercise which makes you 'huff and puff' is known to help stress and will lead to the release of the hormone endorphin - the happiness hormone which has pain-killing properties 2,000 times more powerful than morphine! Dance, whistle or sing - the rhythm and the breathing and the exercise will all increase the feel-good factor. Make a note of favourite jokes, see a comedy, listen to tapes or watch video's of your favourite comedians. Having a really good laugh is very effective in reducing stress. Breathing exercises may be helpful, please see later information. Massage is known to help - please see later information . Meditation, or relaxation using cassette-tapes are likely to be especially beneficial to those who tend to drive themselves hard and find little time to rest - balance between mental and physical activities is good. Sometimes when partners are both feeling under pressure a good, long hug and kiss will say a lot more than words at the end of a heavy day. Better to do this than increase one another's burdens. A food, drink or present may all help BUT remember only a little of what you fancy does you good! Learn to take care of yourself by:- resting, learning to say 'No' (assertiveness will help), eat well - more wholesome food, spiritual concerns may be important at times of threat or change - find the answers you need. GO WELL. Please add your own favourite stress fixes below and ENJOY! Stress may be described as the physical, chemical, or emotional changes which may lead to physical illness, if excessive or prolonged. Dr. Hans Selye, an authority on stress identified three stages in the stress response. In the first stage, alarm, the body recognizes the stress and prepares for action, either to fight or escape. Endocrine glands release hormones that increase heartbeat and respiration, elevate blood sugar, increase perspiration, dilate the pupils, and slow the digestion. In the second stage, resistance, the body repairs any damage caused by the alarm reaction. If the stress continues, however, the body remains alert and cannot repair the damage. As resistance continues, the third stage, exhaustion, sets in, and a stress-related disorder might result. Stress-Related Disorders are diseases or injuries brought on or worsened by psychological stress. These psychosomatic disorders commonly involve the autonomic nervous system, which controls the body's internal organs. Some kinds of headache and facial pain, asthma, stomach ulcers, high blood pressure, and certain kinds of injury, such as repetitive strain injury and backache, are examples of stress-related disorders. Doctors have long recognized that people are more susceptible to diseases of all kinds when they are subjected to great stress. Some research studies show that stress adversely affects the immune system. Negative events such as the death of a loved one seem to cause enough distress to lower the body's resistance to disease. Positive circumstances and events creating even mild stress, however, such as starting a new job or having a new baby in the house, can also upset a person's normal ability to fend off disease. Social scientists have devised a list of life events and rated the relative stressfulness of each. Thus: the death of a partner rates 100 on the scale, whereas trouble with one's employer rates 23; being dismissed from a job, 47; going to jail, 63; a change in sleeping habits, 16; and getting divorced, 73. Motivational assessment may be useful to take stock of your life. Although stress can exert some influence on an individual's susceptibility to, and the progress of, any disease, such as a cold and perhaps even cancer, it can have a more direct effect on others. High blood pressure, or hypertension, is one of the most common disorders made worse by stress. Although it has no noticeable symptoms, hypertension can damage the kidneys and can lead to a stroke. Other stress-related disorders that are even more common are gastrointestinal problems. More serious are peptic ulcers, which are caused by an excess of gastric juices, or unusual sensitivity, or by the bacterium Helicobacter pylosi in an area of the stomach lining, causing nausea and pain, others include inflammatory diseases of the colon and bowel, such as ulcerative colitis and regional enteritis. Respiratory disorders also can be affected by stress. Most common of these is asthma, which may be caused by emotional upsets. Asthma attacks are characterized by wheezing, panting, and a feeling of being suffocated. In addition, emotional stress can cause or aggravate many skin disorders, from those that produce itching, tickling, and pain to those that cause rashes and pimples. Major traumatic events such as accidents, catastrophes, physical attacks or successive traumatic experiences may bring on a condition now called post-traumatic stress disorder (PTSD). Once known under war conditions as shell-shock or battle fatigue, PTSD gained its current name after it appeared in many veteran soldiers returning from the Vietnam War as they tried to readjust to civilian life, and it has been linked to the so-called shell-shock suffered by World War I veterans. Its symptoms, which may take months to appear after an initial state of numbness, include nervous irritability, difficulty in relating to surroundings, and depression. As described earlier, scientists attribute at least part of this effect to evolutionary history, reasoning that at one time people had to live with constant physical threats from wild animals and the elements, as well as from one another, and that the body developed in a way that was essential to survive with these physical stressors. The heart beats faster, blood pressure rises, and other body systems prepare to meet the threat. When we do something active to cope with a threat, these systems return to normal. Running away or fighting, the so-called fight or flight reaction, are both successful ways of coping with many physical threats. Problems arise, however, when the body is prepared, as described, to cope with danger but fight or flight is not appropriate. Being caught in a traffic jam, for example, can cause the body to prepare for a fight-or-flight response, but when no action can be taken, the body's systems remain overly active. Similar repeated experiences of this frustrating nature can lead to the conditions previously described, such as high blood pressure. As mentioned leisure choices which mimic flight or flight are healthy choices generally, but especially when we are stressed. Many other determinants are under investigation including a certain type of behaviour that scientists used to call type A, a term originally applied to people who are prone to coronary artery disease. Some researchers claim that the type-A lifestyle, which is characterized by competitive, hard-driving intensity, is associated with an increased incidence of several stress-related disorders. Type A people are sometimes called "workaholics". However, more recent studies indicate that the unemployed and overworked individuals may be equally prone, whether they behave competitively or not, and that some people can cope with far more stress than others without becoming ill. Treatment Treatment of stress-related disorders is sometimes limited to relieving the particular physical symptom involved; for example, hypertension may be controlled with drugs. However, strategies such as self-assertion, meditation, yoga, and other methods described later may help us reduce the sources of stress or else to learn to cope more effectively with them. Combinations of physical exercise and psychological therapy are recommended, and permanent changes in lifestyle or working methods or even a temporary change, such as a holiday, may also be helpful in alleviating stress and stressors. Please refer back to 'Stress-strategies' and try them - reading is not enough! Aromatherapy uses a combination of body and face massage with essential oils extracted from plants; it falls somewhere between herbal medicine and beauty therapy, and is said to be very relaxing. The essence of a plant is made up of aromatic oils which appear in various parts of a given plant in various amounts, at various times of the day. They can occur, for example, in the root of calamus, in the flower of lavender, in the bark of sandalwood, in the leaves of rosemary, in the resin of myrrh and in the rind of citrus fruits. They are widely used in modern society in foods, toiletries and pharmaceuticals. Use of clove oil for toothache, and eucalyptus oil for inhalation, is widely known. Because they occur in tiny amounts and the distillation process involved is laborious, essential oils can be very expensive; it takes 2,000 pounds of rose petals to produce one ounce of rose oil. Synthetic alternatives produced in laboratories are cheaper, but the leading experts believe that these synthetic oils do not have the same properties and are therefore no substitutes for the real thing. Several scent pots were found in Tutankhamen's tomb, suggesting that aromatherapy was employed by rich Egyptians in ancient times. Greeks and Romans also used it but in Britain it was not until the sixteenth century that its effects were first noted, and by the end of the eighteenth century it was widely available. Soon, however, it was abandoned in favour of powerful drugs and the whole subject came to be regarded as cranky and obscure. Although aromatherapy has had a revival, and is now widely used in France and on the continent, it is practiced in the UK by relatively few therapists. The Alexander Technique is a method of re-learning how to use muscles, to avoid tension by improving the awareness and use of the neuromuscular mechanism which controls balance, movement and posture. Teachers of this method start by noting and correcting pupil's characteristic patterns of body misuse and any faulty posture habits, which are creating physical and mental tension. The pupil is taught to recognise and apply the best pattern of movement and posture for him or her and is then able to practice the method as a self-help technique. Students of the method find themselves gradually adopting better physical postures and also unwinding mentally. Good posture helps good breathing and involves relaxing each part of the body. Massage can be done sitting or lying. This sequence is for sitting. Sit the person to be massaged, the receiver ®, on a dining room type chair - sideways, if the chair has a high back where the shoulders would not be above the back of the chair if sitting conventionally. Start by standing behind R and placing both hands, palms down, on the shoulders. Your touch should be reassuring, firm, but not forced. Check that you and R are comfortable. Relax your breathing and wait until you have a sense that R is receptive to your touch. Leave one hand resting on one shoulder, while you concentrate on working on the other side at the point where the neck and shoulders meet. Begin gently. Use your thumbs and fingers to make gentle circular movements to move the tissue. Gently knead and squeeze. Gradually work along the top of the shoulder towards the shoulder joint. Do gentle movements around the shoulder joint. Gradually loosen the tissue, not forcing, but gradually encouraging places of hardness and stuckness to loosen and relax. Ask for feedback: Too hard? Too soft? More? Less? etc. Pay special attention to the neck 'edge' and shoulder joint. Now move to the part between the shoulder blade and spine. Continue using small circular movements to loosen the structures here. Feel for the little nooks and crannies. Work gently at first and as R relaxes work more firmly and deeply. Now continue with this circular stroke all over the shoulder blade, again loosening as before. Check that you yourself are relaxed: breathe. Now repeat 2-4 times on the other side of the back. 6. With both hands, gently 'brush off' the back. Imagine you are dusting off the surface of the back, sweeping dust particles as far away form R, into the air, as can be reached. Do not work over the spine. Check frequently with R: massage should not be painful. There are three major bands of muscle on each side of the spine. Mentally divide the neck into three parts on the left-hand side of the spine and going round to the front of the neck, and similarly three parts on the right-hand side. Place both hands on R's shoulders. Wait, breathe and relax. Then leave one hand as support on the shoulder, and work on the opposite side. Begin with the band of muscle of the neck nearest to the spine. Use fingers to do small, gentle circular movements up the neck. Pay particular attention to the point where the neck meets the shoulders and where the neck meets the skull. Work gradually, gently to soften the structures in the neck. Continue by doing these strokes up the middle band of that side of the neck. Do the band of the neck round at the front. Repeat steps 3-5 on the other side of the spine. Do not massage over the spine, or over the windpipe at the front of the neck. Massage should not be painful; ask for feed-back: is your partner comfortable? You may need to support your partner's forehead with one hand (not covering the eyes), or support at the opposite temple, instead of resting your other hand on the shoulder. Ask your partner, R, to let the head be relaxed. Support the forehead with one hand (not covering the eyes). Allow the head to tilt forward. Begin on one side of the head. Feel the bony ridge where the skull meets the neck. Start from behind the ear, making small circular movements along, above and below the bony ridge. Gradually loosen the structures, not forcing; ask for feedback: too hard? too soft? too slow? too fast? When you get to the centre back of the head pay special attention to the bony lump and hollow there. Continue doing small circular movements. Use fingers and thumb. Change hands and support, and now work on the other side of the head. To finish, using both hands and starting for the neck, brush upward along the neck and out of the head, imagining that you are brushing away lightly any loosened tension. Let your partner's head rest lightly backwards onto your chest. This enables you to use both hands sometimes. Check for comfort. Start with the forehead. Mentally divide the forehead into three horizontal bands (lower, middle, upper). Use fingers/thumbs of both hands, starting just above the nose and between the eyes to smooth upwards across the skin. Take your thumbs up and then out towards the temples, and then beyond the head. Imagine that you are pulling tension out and leaving it in the atmosphere. Repeat this several times. Then move on to the middle band of the forehead. Start against between the eyes, draw your fingers/thumbs up to the middle band, then towards the temples and out beyond the head. Repeat the process for the upper band. Then use your whole hand to cover the brow and smooth across it several times, making sweeping movements with your hands, taking the movement beyond the head. Use both hands, one on either side, to make circular movements with fingers or thumbs around the temples. Move the skin against the bone there. Be gentle. Then pull the tension out with your fingers in a movement going beyond the head. On yourself, feel around the eye-socket. Locate the bony edges of the socket. Then on your partner, who should have eyes closed, use a finger to press gently and then do a circular stroke along this edge. Be very gentle - the skin around the eyes is delicate. Repeat two or three times, then do the other eye socket. Finish by using the fingers to make feather-like strokes across both eyes and beyond the head. Make small circular movements with fingers and thumbs from the corner of the eye down the side of the nose and down the laughter lines at the side of the mouth. Repeat several times. Do the other side. Then smooth the skin with both hands. Either one side at a time or both together, work along the jaw from just below the area round to the chin. Make small loosening circular movements. Pull tension out from the head. Starting from the forehead or the chin, lightly stoke the whole face with both hands. Dust away loosened tension. Draw it away from the head. Use both hands to make small circular movements all over the scalp - as in hair washing. Gently pull the hair. Draw tension away from the head. Let your partner sit quietly for a while. Now wash your hands. The massage techniques can be done to oneself, basically anywhere one can reach such as shoulder, neck or face (the back would be difficult). Massage should never be painful. Do not massage over infected sites, varicose veins, open wounds, swollen joints. If in doubt, don't. Try to keep the rhythm of stokes smooth. Always repeat strokes on both sides of the body. Make sure you and your partner are comfortable. Try to concentrate on what you are doing. Do not let your attention wander. Practice in a warm room with warm hands. We all need to develop some sort of mechanism for relaxing and coping with stress. Simple forms of relaxation which many people intuitively practice include listening to music, going for a walk, playing a game of tennis, golf or other sport, having a leisurely swim, engaging in an active absorbing hobby, having a hot bath, watching television, reading a good book, gardening or looking at family photo albums. Relaxation training Despite using some of the strategies listed above spontaneously or intuitively, we are sometimes more tense than we realise. It is difficult to feel or behave at ease when the body is tense. Unfortunately, sometimes tension remains undetected: the brain pushes the information coming from the body into the subconscious if it is constantly bombarded with that information, particularly if it is also kept busy pursuing daily jobs which have been given top priority. Stress-reducing procedures which can be learned include breathing exercise, relaxation, meditation, self-hypnosis and autosuggestion, visualisation and coping in imagination. They have many elements in common and people vary as to which they find helpful. If one type of approach is unsuccessful or helps only a little, another may be more acceptable and useful. Some techniques are more advances than others. For instance, it is impossible to meditate if you are unable to relax. Learning to relax takes time and practice but do not let that deter you. You do not need to become highly proficient in order to derive some benefit. Breathing exercise Breathing is essential to life. Life begins with a person's first breath and ends with the last. Breathing is automatic and usually involuntary, being controlled (like all other internal functions) by the autonomic, or involuntary, nervous system. However, breathing is unique in that it can also be controlled by an act of will. Since we breathe between 16,000 to 20,000 times a day it can be a very powerful tool in gaining some degree of control over autonomic functions. Breathing patterns often reflect our state of mind or emotions. For example, an anxious person tends to breathe rapidly and often, only using the upper part of the chest; a depressed person tends to sigh; a child, during a temper tantrum, holds his or her breath until blue in the face; the anxious person talks at the end of an inhalation in a high-tone voice; and the depressed person talks at the end of an exhalation in a low-tone voice. How should we breathe? There are two main types of breathing: costal (meaning 'of the ribs') and diaphragmatic (or abdominal) breathing. Costal breathing is characterised by an outward, upward movement of the chest. It is useful during vigorous exercise but it is quite inappropriate for ordinary, everyday activity. Abdominal or diaphragmatic breathing The principal muscle involved in abdominal breathing is the diaphragm, a strong dome-shaped sheet of muscle that separates the chest cavity from the abdomen. When we breathe in, the diaphragm contracts and pushes downwards, causing the abdomen to relax and rise. In this position, the lungs expand, creating a partial vacuum which allows air to be drawn in. When we breathe out, the diaphragm relaxes, the abdomen contracts and expels air containing carbon dioxide. Diaphragmatic breathing is the most important tool available for stress management. It promotes a natural, even movement of breath which both strengthens the nervous system and relaxes the body. It is the most efficient method of breathing, using minimum effort for maximum oxygen. The main benefits of diaphragmatic breathing are that it provides the body with sufficient oxygen, expels carbon dioxide adequately, relaxes the body and the mind and improves circulation to the abdominal organs by its massaging action. Lie on your back with your feet a comfortable distance apart or sit upright comfortably, but not rigidly. Place one hand on your chest and the other hand on your abdomen. Become aware of the rate and rhythm of your breath. Note which hand is moving with your breathing movements. Inhale and exhale slowly, smoothly and deeply through the nostrils without noisy jerks or pauses. Consciously pull in your abdominal muscles when you exhale and, if necessary, push the abdominal muscles gently with your hand. When you breathe out be aware of the abdominal wall pushing out. Now place your hands by your side, continue inhaling and exhaling and concentrate exclusively on the breathing movements, being aware only of your abdomen rising and falling. Practice 3-5 minutes a day until you clearly understand the movement and diaphragmatic breathing becomes your natural pattern of breathing, whether you are sitting, standing or lying down. The oxygen you take in each time you breathe revitalises every single cell in the body. Try to imagine this process actually taking place; through this imagination you can send energy-giving breath to any area which feels dull or sluggish. You can do this exercise sitting down or standing up. Close your eyes if you like. Take a deep breath in and feel the abdomen expand as you bring your arms out from your sides and slowly up over your head. Stretch as you breathe out and slowly bring down your arms. As you breathe in again, imagine your breath revitalising your entire body, filling it with energy and dissolving away the tension. Feel it becoming alive, with oxygen spreading through every part of your body as you bring your arms up again as in 2. Slowly exhale and bring your arms down by your side. Repeat the above sequence 3 times. Notice any sensations you may feel, for example warmth, relaxation, tingling. Now focus on an area where you feel tension, for example, between the shoulder blades. Take another revitalising, deep breath and feel it moving into the tense area. Imagine your warm breath massaging the area and easing away the tension. Exhale. Choose another tense area to focus on and repeat the exercise. Take a few extra inspirations and expirations and imagine your body full of vigour and vitality. Stretch slowly as your palms reach up to the ceiling and rock your body from side to side by switching your weight from your left foot to your right foot. Slowly bring your arms down to your sides. Stand still for a few seconds and enjoy the sights and colours around you. Continue with your routine feeling refreshed and happy. Practice twice a day for about 3 minutes each time. One-breath relaxation Several times during the day become aware of your breathing. Take one deep breath, feel the energy coming in and revitalising your body. Breathe out and relax. Use frequent occurrences in daily life like waiting for someone to answer your telephone call, getting in or out of the car, or stopping at red traffic lights whilst driving. You should be able to fit in approximately 20 such one-breath relaxation exercises during your entire day. Each time one of your muscles contracts, thousands of electrical impulses travel along the nerves to the brain. There is scientific evidence which suggests that a part of the brain called the hypothalamus, which controls stress-response with its mental, emotional, behavioural and physical components, becomes highly charged when it is bombarded with a variety of sensory stimulations. When the hypothalamus is sensitised in this way, everyday stressors can easily lead to stress-response. It is possible to cut down drastically on the sensory impulses traveling to the brain simply by lying down, closing your eyes, learning not to be distracted by external noises and then deeply relaxing the entire body. The result is amazing: both body and mind return to a state of balance or recuperative rest. Such relaxation should occur spontaneously after any activity but, unfortunately, the endless demands of modern life often prevent this. The result is an accumulated state of stress which can eventually culminate in a stress disorder. You need to learn the art of letting go and allowing your body's restorative ability to take over. Practice relaxation on an empty stomach or at least one and a half hours after a light meal. Make sure you are comfortable in loose-fitting garments. Loosen your tie, belt and other constricting clothes. Lie flat on your back on a firm bed or on folded blankets on the floor. Make sure your head, body and legs are in a straight line. Keep your legs a little apart and allow your feet to flop loosely so that your heels are pointing inwards and toes are pointing outwards. Keep your hands by your side with palms upwards and fingers slightly flexed. Exhale and inhale through your nostrils and breathe slowly and rhythmically using your diaphragm. Take your mind to different parts of the body sequentially, become totally aware of every aspect of the feelings in each part of your body. Imagine each part relaxing as deeply as possible and savour the feeling of relaxation for a few seconds. The sequence in which you relax is suggested as follows: - right toes, instep, heel ankle, leg, knee, thigh and hip - left toes, instep, heel, ankle, leg, knee, thigh and hip - right fingers, thumb, palm, wrist, forearm, elbow, upper arm and shoulder - spine, lower back, middle back and upper back - chest, sides, abdomen - neck, jaw, lips, tongue, face, muscles around the eyes, forehead and scalp. The body should be completely and totally relaxed. Stay in that state of relaxation for 5-10 minutes. To come out of relaxation, take one deep breath, feeling the energy coming down into your arms and legs. Move arms and legs slowly. Open your eyes slowly, sit up and stretch your body, feeling refreshed and re-energised. Practice at least once and, if possible, twice a day. Once you have mastered the technique you should be able to relax appropriately - sitting, standing or lying down - and within a matter of seconds. The overall principle of progressive relaxation is that each of the main muscle groups in the body is first tensed, then held taut, and then relaxed in turn, until the whole body is relaxed. The idea is that before you can relax your body, you must learn how your muscles feel when they are tight and tense. Letting go after tensing gives a physically pleasant feeling in the relaxed muscles. It is essential to develop this awareness of the difference between muscle tension and muscle relaxation. Try clenching the hand into a fist, holding it tight for a little while and then letting go, appreciating the feeling of release. Or hunch up you shoulders, stay that way, and then let all the muscles go. Relaxation methods involving tensing the muscles are not recommended by some doctors for people with hypertension (high blood pressure). The best way to learn relaxation is probably by attending a class, with a teacher. It is also possible to buy tapes or records giving instructions for you to follow, or you may be able to get hold of some written instructions which a friend or relative could read out to you. Alternatively, you could yourself record the instructions on to a tape and play it back when you want it. If you want to practice relaxation, you should allow at least a quarter of an hour a day and try to follow the same sequence every time. Relaxing surroundings are helpful but not essential. It is best (at least at first) to choose a quiet, dimly-lit room where you can be warm and comfortable and not subject to distractions. Relaxation should not be practiced for an hour after a light meal, and one and a half hours after a big meal. A full stomach not only hinders relaxation of the body but may also lead to indigestion if the stomach becomes relaxed. Above all, relaxation should be enjoyable, otherwise it will not work. Begin by taking off your shoes and loosening any tight clothing, especially around the neck and waist. Adopt a relaxing posture: the easiest is probably lying down. Lie down on a carpeted floor, or a bed - provided it is not too soft. Each part of your body should be supported comfortably. Lie with your arms and legs a little apart. It is better to do without a pillow. You should tense and relax each part of your body in turn, starting either with hands and arms, then head and down through the trunk to the legs, or starting with the feet and legs and working up through the body. If you begin with the hands and arms, you should first clench the fists, which also entails clenching the forearm muscles. Hold this for a little while, perhaps 10 seconds, and feel the tension; then let go and feel the difference - a sensation of welcome release. Then hold the hands (fists clenched) against the shoulders so as to tense the upper arms, feel the tension, and then let go. Next the neck can be held taut with the chin pressed in then relaxed, followed by the different facial muscles - forehead (frown and relax), eyebrows (raise up then release), eyes, mouth (purse up and release), jaw (thrust forward and release), then the shoulders (hunch up then let go), stomach, buttocks, thighs, legs and feet. Each time you should consciously feel the tension before you let go. After tensing and relaxing each muscle group in turn, you should feel relaxed all over. Instead of thinking of yourself in parts, be aware of the whole body and if you feel any remaining tension anywhere, try to realise it - if necessary by first deliberately tensing the affected muscles and then letting go. Allow 5 to 10 minutes at the end in which to enjoy your relaxed state. You should be breathing quietly, with slow and gently breaths. You may want to imagine a peaceful scene, for instance lying peacefully by the side of a blue lake, with green grass and trees, the song of the birds, the warmth of the sun, your body warm, heavy and relaxed. Choose your own imagined scene - whatever you like best. When you are ready to get up, first have a good stretch, then either sit up very slowly or turn over (on to your side first into what is called 'the recovery position') then get up. Your aim should be to carry over your relaxed state into whatever activity follows your period of relaxation. Although it is easier to practice relaxation while lying down, sitting is also fine. You can practice in an armchair - and in time you should be able to relax even in an office chair or on a bus or in the driver's seat of a parked car, or wherever you happen to be at the time. Staying relaxed Once the technique of relaxation has been learned, it should be possible to relax without first tensing all the muscles and it should be easy to detect any area of tension and quickly release it. Throughout the day, get into the habit of checking whether you are tensing any muscles unnecessarily. If you are, you are not only wasting energy and effort but could well bring on headache, neck ache, and backache. If your face is tensed and mouth turned downward, relax it and consciously force the corners of your lips upwards into a smile. It may be mechanical but helps you to feel less dejected or stressed. www.mindifo.co.uk has further information that you may find useful. Creative visualisation is the technique of using your imagination to create what you want in life, and is based on the principle that mind and body are intimately connected. Changes in the physical state of your body create changes in our mind and, similarly, every mental image leads to physical changes in the body. We use visual imagery all the time, although most of the time we are not conscious of it. Through visualisation, we learn to use imagery consciously. Images are an important part of our everyday experience. We are equipped with the capacity not just to see what is around us, but to see 'with our mind's eye', for example, reconstructions of things past, current experiences, or symbolic representations. Whenever we create something, we always create it in the mind or thought first. Without thought there is no action. You do not take a bath before you think about or imagine having a bath. Images supply us with creative energy or drive. The use and practice of imagery techniques can increase our awareness and understanding of our physical and psychological functioning. To start with, choose goals that are easy to accomplish before setting more difficult or higher goals. Confidence can be built through success only and setting unrealistic goals is a recipe for failure and thus negative reinforcement. Create a clear mental picture. It may not be necessary to see the image itself, as one person in every ten finds if difficult to have a visual image, but your thoughts should be clear. Think of your goal in the present tense, as if it already exists and you are within the situation you desire. It is not cheating yourself but affirming that situations are first created in the mind. Focus on the picture repeatedly, both in a quiet meditative state, as well as casually during the day. Make it an integral part of your life. The picture should come to you effortlessly, without striving. Practice before going to sleep or when you wake up in the morning, as body and mind are more relaxed. Give the picture more positive energy as you focus on it by making positive, encouraging statements, or affirmations as they are often called, and by picturing yourself as actually achieving that goal. During these affirmations suspend all doubts or disbeliefs you may have about achieving your goal. Dr Emile Coue, a French chemist and psychotherapist, first coined such positive affirmation with the well-known phrase, 'Day by day and in every way I am getting better and better'. Scientists sometimes laugh at this but it is said to have cured thousands of people with distressing illnesses.